I have just recently sold this listing at 410 4900 CARTIER STREET, Vancouver. I have just recently sold this listing at #205 - 55 Alexander Street, Vancouver. I have just recently sold this listing at 1328 E 6TH AVENUE, Vancouver. View my new listing for sale at 205 - 55 ALEXANDER STREET and currently listed at $499,900. Located on a picturesque Gastown Street, “55 Alexander” is a year 2000 built Cressy developed building, with heritage style architectural elements. The suite is a spacious 627 sq.ft. 1 bedroom + den/flex room, with northern views over the trains and towards the North Shore Mountains and Ocean. Inside are wide-plank wood floors, a galley kitchen with s/s appliances, backsplash, gas range, stone counters, gas fireplace and a wide living area with patio. Plenty of storage and thoughtful design throughout, including a built-in bar, walk-in closet, & cheater ensuite bathroom. Well maintained building that allows rentals (with a 6 month minimum) and pets. There is a common rooftop deck with high views of the city, ocean and mountains. BONUS 1 underground parking stall, and 1 storage locker. Located on a picturesque Gastown Street, “55 Alexander” is a year 2000 built Cressey developed building, with heritage style architectural elements. The suite is a spacious 627 sq.ft. 1 bedroom + den/flex room, with northern views over the trains and towards the North Shore Mountains and Ocean. Inside are wide-plank wood floors, a galley kitchen with s/s appliances, backsplash, gas range, stone counters, gas fireplace and a wide living area with patio. Plenty of storage and thoughtful design throughout, including a built-in bar, walk-in closet, & cheater ensuite bathroom. Well maintained building that allows rentals (with a 6 month minimum) and pets. There is a common rooftop deck with high views of the city, ocean and mountains. BONUS 1 underground parking stall, and 1 storage locker. Built for the architecture connoisseur. One of a kind architecural modern loft style home. Rarely available steel frame construction. Finely detailed interior including hardwood surfaces, custom millwork cabinets and wall units, steel and glass railing and stairs, glass floor on upper levels to transfer light from skylight, travertine marble, limestone, and illuminated with large windows and skylights. Large kitchen with the quality European appliances from Miele, Wolf, and Kohler. Approx 1600 sq.ft. of inspired living space with 2 bedrooms, 3 bathrooms. open plan living room with 16' double height ceilings, floor to ceiling glass, floating steel/wood staircases, 3way fireplace, fully heated 245 sq.ft. attached garage, and 200+ sq.ft. of balconies. Endless storage & beautiful views of mountains and city. Enjoy the south facing roof top deck. Green garden out front. Close to transit. 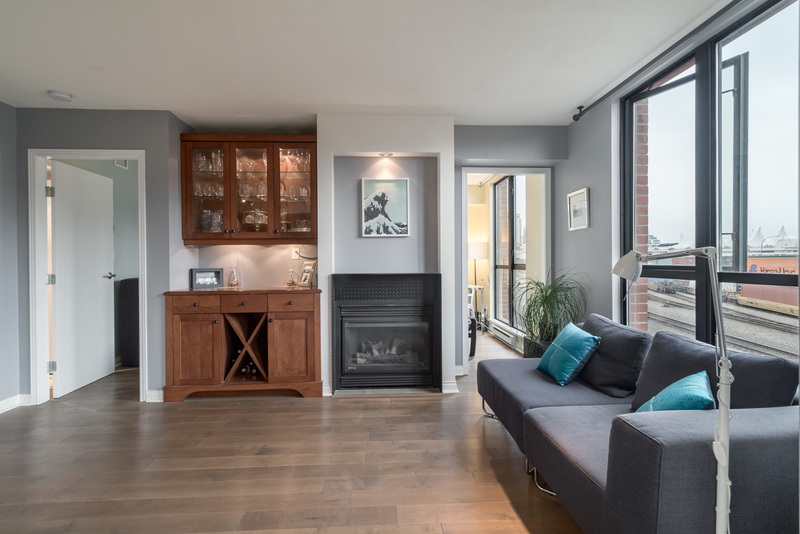 I have just recently sold this listing at 504 - 546 Beatty Street, Vancouver.